TS Vidya Volunteers Recruitment new guidelines 2016-17-GO.97, educational qualifications for PS VVs and UPS VVs, weightage for qualifications,selection list/merit list preparation, selection procedure and schedule details given here. GO.Rt.No.97;Date:29.06.2016: Govt of Telangana, School Education - Engaging the services of (9335) Vidya Volunteers through School Management Committees (SMCs) with an Honorarium of Rs.8000/-(From 2017-18, Rs.12,000/- as per GO.86)per month in the Academic Year 2016-17 - Permission Accorded-Orders - Issued. 2) From the Director of School Education, Telangana, Hyderabad, Lr.Rc.No.330/PS2-2/2015, dt.23.5.2016. 3) From the Director of School Education, Telangana, Hyderabad, Lr.Rc.No.330/PS2-2/2015, dt.14.06.2016. 4) Government Memo No.3630/SE.Prog.I/Deptt, dated 18.6.2016. 5)From the Director of School Education, Telangana, Hyderabad, Lr.Rc.No.330/PS2-2/2015, dt.27.06.2016. ORDER: In the circumstances reported by the Director of School Education (DSE), Telangana, Hyderabad in the references 2nd & 5th read above, after careful examination of the matter Government hereby accord permission to the DSE, Telangana, Hyderabad to engage the services of (9335) (Nine Thousand, Three Hundred and Thirty Five) Vidya Volunteers with an Honorarium of Rs.8000/-(Rupees Eight Thousand only) per month in the Academic Year 2016-17. 2) The DSE will allot the number of Vidya Volunteers to be engaged District wise, based on the Enrolment Data of the Schools for the Academic Year 2016-17 and by taking into account the regular Teachers working, the vacancies available and based on the norms issued vide G.O.Ms.No.11, School Education (SER-II) Department dated 15.6.2015 about rationalisation of the Teacher posts and Staff under various managements viz., Government, Zilla Parishad and Mandal Praja Parishad Schools. 3) In the reference 3rd read above, the Director of School Education, Telangana, Hyderabad had informed that due to non-availability of regular Teachers in the Schools in the districts, he has permitted the District Educational Officers to engage the services of 1606 (One Thousand, Six Hundred and Six) Vidya Volunteers, through School Management Committees where there are no regular Teachers available in the Schools on the day of the reopening of the Schools i.e 13.06.2016 for the Academic Year 2016-17 and requested the Government to ratify/ confirm the action taken in the matter. 4) In the reference 4th read above, the Government ratified the action of the Director of School Education in permitting the District Educational Officers in the State to engage the services of (1606) Vidya Volunteers through School Management Committees in the Schools, where there are no regular Teachers available for the year 2016-17. 5) Based on the reference 5th read above, the Director of School Education, Telangana Hyderabad is requested to follow the Guidelines enclosed to this G.O. as Annexure scrupulously in engaging the services of the Vidya Volunteers for the Academic Year 2016-17. 6) The DSE, Telangana, Hyderabad shall take necessary action in the matter accordingly. 7) This Order issues with the concurrence of the Finance (EBS.IV) Department vide their U.O.No.7019/138/EBS.IV/SE/2016, dt.22.06.2016. 1. The services of Vidya Volunteers will be engaged from 16th July, 2016 to 20th April, 2017 in the Schools as approved by the District Collector concerned. Their services are purely temporary and can be terminated before 20th April, 2017 also, based on justifiable grounds, by the School Management Committees (SMCs). 2. The services of Vidya Volunteers shall be engaged to ensure regular functioning of the Schools . 3. Candidates should have completed 18 years of age and upper age limit is 44 years as on 1st July, 2016. (5) years relaxation is given in case of SCs / STs /BCs and (10) years for Physical Challenged persons. 5. The DEO shall communicate the list of Schools along with roster points to the Mandal Educational Officers concerned for engaging the Vidya Volunteers. The Mandal Educational Officers in turn shall display the details on the Notice Boards of the Mandal Resource Centers, Primary Schools ,Upper Primary Schools, High Schools and all Gram Panchayats in the Mandal. The District Educational Officer shall give a Press Note stating that the eligible Candidates shall apply online and display the details on his website. i) Copies of the SSC, Intermediate, Graduation, Post Graduation ,D.Ed., B.Ed., TET , Pandit Training, Oriental Title/ Bhasha Praveena/ Vidhwan along with Marks Memo. 7. Engaging of Vidya Volunteers in Agency area shall be from local ST Candidates only. If local ST Candidates are not available, then other ST Candidates from Agency Area and later non-ST candidates residing in the Agency area shall be considered . b) For Upper Primary & Secondary Schools(Classes VI to X): Graduation with B.Ed. i. Graduation in the language concerned as optional and Pandit Training or B.Ed., in the relevant methodology. 10) If weightages of two or more Candidates are equal, qualification and then age shall be taken into consideration for arriving at the order of Candidates in the merit list. 11) Mandal is the unit for engaging of Vidya Volunteers basing on the roster points allotted to the Mandal. Merit lists shall be generated for each Mandal. As far as possible, Candidates belonging to the same Mandal shall be engaged as Vidya Volunteer. If qualified Candidate is not available for a particular roster point in the Mandal, Candidates from the other roster points may be taken from the same Mandal. For Example If no ST (W) Candidate is available in the Mandal, ST (General) may be considered . If no ST candidate is available in the Mandal, SC (W) may be considered . If no SC (W) Candidate is available in the Mandal , SC (G) may be considered . If no SC candidate is available in the Mandal, following sequence shall be followed BC-A (W), BC-A (G), BC-B(W), BC-B(G), BC-C(W), BC-C (G),BC-D(W), BC-D (G), BC-E(W), BC-E(G) , OC(W), OC(G). In case of non-availability of candidates for Ex.Servicemen quota/ PHC quota in the Mandal, Candidates from Open Completion list may be considered. a) Natives of the village shall be given first preference. b) Candidates from adjacent village in the same Mandal shall be given 2nd preference. c) If the Candidates are not available in that particular village/ adjacent village, then the candidates from General Merit List of the Mandal shall be considered basing on the merit duly taking options from the Candidates. d) If Candidates are not available in the Mandal, same category of Candidates from neighbouring Mandals (having common borders) may be considered based on merit. 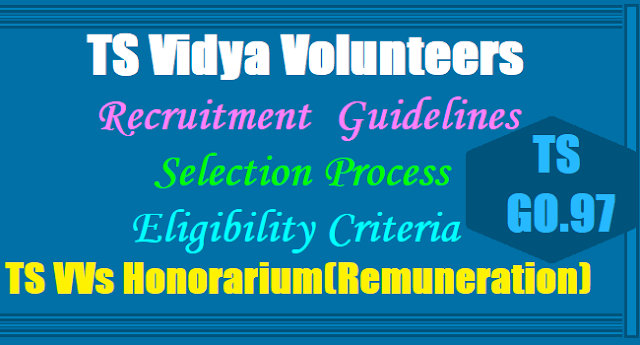 e) The selected Vidya Volunteers shall given an undertaking to the SMCs that they shall stay in the Headquarters. 14). The District Collector shall oversee the entire process of engaging these Vidya Volunteers duly considering the Vidya Volunteers already engaged as per the references 3rd & 4th cited in the G.O. They shall decide based on the enrolment status in the Schools as on 30.06.2016; the regular Teachers available; vacancies available and also based on the rationalization norms indicated in the G.O.Ms.No.11, Education (Ser.II) Department, dt:15.06.2015 and G.O.Ms.No.17, Education (Ser.II) Department dt:27.06.2015 about the number of Vidya Volunteers required. After finalization of the Lists of Vidya Volunteers by the District Level Committee, the same shall be communicated to the Mandal Educational Officers for onward communication to the School Management Committees for engaging the services of the Vidya Volunteers in the Schools Any grievances on these Final Lists shall be considered in Appeal by the Director of School Education within a week from the date of publication of these Lists by the SMCs. 15) The Cluster Head Master concerned shall be given the responsibility to coordinate with the SMCs concerned to engage the services of the Vidya Volunteers. The SMC concerned will enter into an Agreement with the Vidya Volunteer in the prescribed format, which is to be forwarded by the DSE to all the DEOs.